This history lesson plan explores some of the foods eaten in the pioneer world. 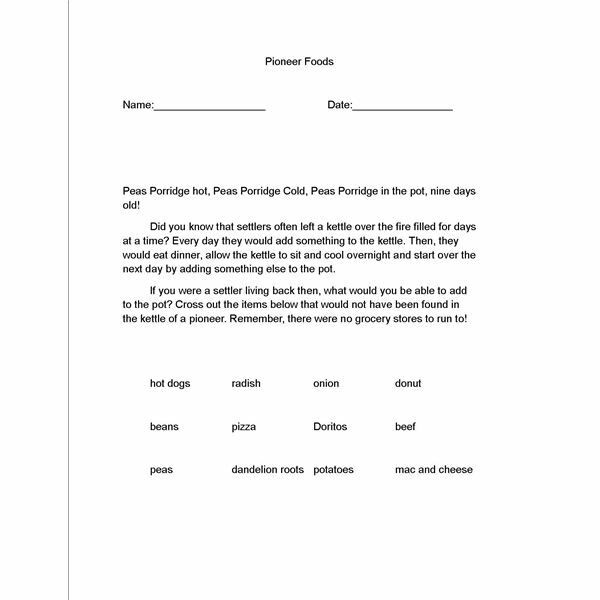 Read this history lesson plan with your American history students, then do the attached history worksheet with your students to reinforce what they have learned about pioneer foods. What Did the Pioneers Eat? In the pioneer world, people were not able to go to the nearest grocery store to pick up food for dinner. If you had used the term “fast food” with one of the pioneers they would have thought you picked something from the garden and ate it, because preparing food in the pioneer world was an art, as well as a chore. Have you ever had to get creative to make something to eat at home? Pioneers constantly had to get creative and try new things in order to survive. Read below to see what kinds of things the pioneers would have eaten and how they were prepared. Meat. Pioneers hunted for their meat, but the work did not stop there. Once they made the kill, they would have to clean and prepare the meat for storage. First the meat would have to be skinned and the insides removed. Then it would have to be cut into manageable chunks. Once the meat was cut up, pioneers would often salt their meat heavily in order to preserve it for long periods of time. The result was that when the pioneers went to cook the meat, they first had to scrub it in order to remove the salt and make the meat taste good. Pioneers ate lots of vegetables because they could be grown in large amounts and canned if the pioneers had the materials to can with. If they did not have the materials to can with, then they would simply dry out what vegetables they could and cook them later. However, one frost could destroy an entire crop and there were no grocery stores to go to in order to get more! As you drive down the road in the summer, you may notice signs for “U-pick” fruits such as strawberries and blueberries. Pioneers had to go into the forest to pick their berries. In doing so, pioneers would have to be aware of any bears that might also want to be picking berries! Fruit was dried for later use or canned if the materials were available. Fruit was often the only “sweets” that pioneers had access to! Pioneers often ate heavy meals. But there was virtually no obesity. Why is that? All their foods were natural with no chemicals and they were constantly working so they never had a chance to just sit! History often repeats itself and you can see that in the foods around you now. The next time you go to the grocery store, look around you and you will notice more and more dried fruits and nuts and organically prepared foods. These are the types of foods pioneers ate and they are much healthier than any type of fast food you may buy! This article series includes a printable worksheet for ever article. These articles on the history of the pioneers will assist in teaching young learners about the lives of the pioneers. Lesson Plan: What Kind of Homes Did the Pioneers Live In?